The first edition of the Class 40’s American Trophy, rewarding those teams that participate in the North American races on the Class calendar, has been won in convincing fashion by a European team* organized by the French skipper Catherine Pourre on her Manuard designed Mach40.3 Eärendil. 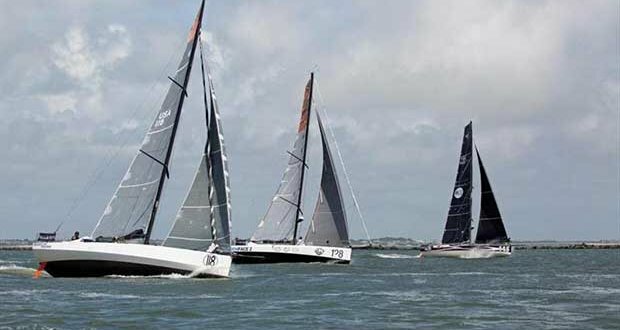 In taking the victory, she beat two American teams including Dragon, an Owen Clarke design skippered by Michael Hennessy and the winner of the 2018 Miami to Havana race, and the Farr designed Privateer, skippered by its new owner Jonathan Green. The 16 teams participating in the North American circuit of races included 3 Vintage boats and showcased the international nature of the Class40: 7 American boats, 4 French, 1 English, 1 German, 1 Angolan, 1 South African and 1 Swedish. Eärendil was the Class40 winner of the RORC Caribbean 600, setting the record in a 2018 edition where the eight participating Class40s saw particularly high winds and challenging reaching conditions. BHB, the Verdier designed and St. Malo built Tizh40 skipperd by Louis Burton finished second, and Iskareen, the German flagged PogoS3 skippered by Arnt Bruhns completed the podium. Catherine Pourre and Pietro Luciani also dominated the two offshore legs of the Atlantic Cup (Charleston – New York and New York – Portland Maine), thereby securing the overall victory for this iconic Class40 competition. This year’s edition saw eleven Class40s spend 15 days racing up the eastern seaboard of the USA, where 500 miles of the Gulf Stream with its 4 to 6 knots of current and counter currents help make this race a notoriously difficult tactical challenge and extraordinary experience. The American Trophy was established in 2017 with a corresponding European Trophy, and it found its legs this year with a growing number of American boats participating alongside Europeans who ended up on this side of the Atlantic following the winter transatlantic races. Well organized events, favorable offshore courses well suited for Class40s and unfailing hospitality made for an intense level of competition in both the Caribbean and USA. The events in the American Trophy circuit consist of offshore races ranging from 300 to 1000 miles such as the Miami to Havana Race, the RORC Caribbean 600, the Atlantic Cup and next year’s Pineapple Cup from Miami to Jamaica as well as the Bermuda 1-2 with its solo leg from Newport to Bermuda and double handed return. The circuit also includes two events with an inshore format, the Voiles de St Barth and Grenada Sailing Week. For the Europeans, there are excellent opportunities for the transatlantic return to Europe, with the Bermuda – Hamburg race running this year, the New York Yacht Club organized 2019 Transatlantic Race from Newport to Cowes starting on June 26 in 2019, and then the Quebec Saint Malo race in july 2020.